Safety and comfort in all weather conditions. 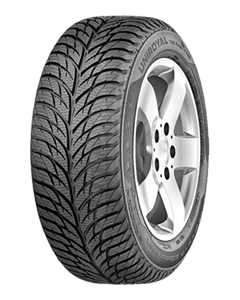 The directional tread has specific segments for summer and winter use. This ensures optimum safety and comfort under all weather conditions. A more rigid tread reduces deformation on bends. This enlarges the area over which forces are transferred to the road and leads to improved handling on dry roads. The improved water and mud drainage from the profile and the balanced response to steering movements on wet roads lead to a superb handling on wet road and reduced risk of aquaplaning. Excellent traction and braking performance on snow. The improved V-shaped tread pattern and optimised sipes increase the area in contact with the road. This maximises traction, grip and especially braking performance on snow.